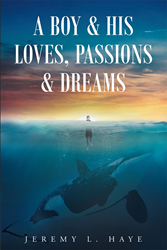 “A Boy and His Loves, Passions and Dreams” from Christian Faith Publishing. The author, Jeremy L. Haye, was born in Los Angeles, California in 1970. Published by Christian Faith Publishing, Jeremy L. Haye’s new book, a fictional novel, starts in Seattle Washington and describes how a young man by the name of Jeremy loves his family and his friends with all of his heart. His passion is to become a Marine Biologist and to work and swim with orca whales. His dream is to swim in the Olympic games and receive several gold medals for the US team. Overcoming incredible obstacles, Jeremy’s life is now complete. Jeremy’s has always tried to hang on to his loves, passions and dreams. View a synopsis of “A Boy and His Loves, Passions and Dreams” on YouTube. Consumers can purchase “A Boy and His Loves, Passions and Dreams” at traditional brick & mortar bookstores, or online at Amazon.com, Apple iTunes store, Kobo or Barnes and Noble. For additional information or inquiries about “A Boy and His Loves, Passions and Dreams”, contact the Christian Faith Publishing media department at 866-554-0919.